Word the invitation so the guests know what type of party to expect. 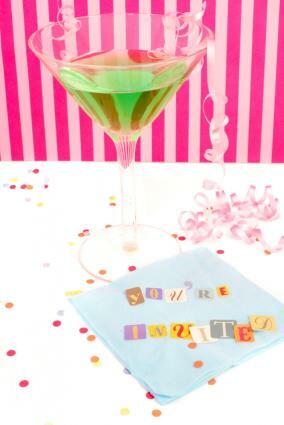 Every fabulous bachelorette party starts with the perfect invitation. Whether your group is hitting the streets for a night on the town, or spending the weekend away, the invitation is the go-to information source for your guests. Create and send the invitation at least a few weeks ahead of time so your guests have time to plan for the extravaganza. Let's paint the town red (or one of the brides wedding colors) with (bride's name) for her bachelorette party! Come celebrate with us as we toast (bride's name) last night on the town! (Bride's name) isn't hitched yet, let's throw her a party she'll never forget! Kick up your heels and party all night long as we celebrate (bride's name)! We're partying without a curfew for (bride's name) last night out! Let's keep her up all night as a single gal, come celebrate with your favorite pal! Sometimes spending the night with the girls is just not enough. Schedule a weekend bachelorette party to celebrate the last weekend of single hood with the new bride. Bachelorette weekend parties will need to be more informative than just a night out. You will also want to call ahead to the hotel and set a reservation for rooms. Always set the RSVP date earlier than a normal party so you have an accurate headcount one to two weeks before the weekend. Before the big Wedding Day unfurls, Let's give (Bride's Name) time with just the girls! Join us for a weekend Bachelorette Party! Only weeks until the big day, It's (Bride's Name) last chance to play! Join us for (bride's name) Bachelorette Party Weekend! We're leaving on a jet plane for a bachelorette celebration! Join us for a weekend in Vegas to celebrate (Bride's Name) upcoming wedding! Come to the beach for the weekend to party with (Bride's Name) for her last night out! Brides that are not into going out may enjoy a day at a winery or shopping in a quaint village for her bachelorette party. Keep the wording simple and tasteful to accommodate the bride's wishes for a more casual affair. A last drink for the single life before (bride's name) becomes a wife. Join us for a day at the wineries for (bride's name) bachelorette party. We're shopping the day away to celebrate (bride's name) last day as a single gal! Join us on Main Street for shopping and lunch! Skip going out and have a girl's night in with a lingerie party. These parties offer girls a chance to gather at a friend's house and have a fabulous time together. When inviting guests to a lingerie party the wording should inform guests to bring a piece of lingerie for the new bride. Throw out the granny undies and bring on the lace with a lingerie bachelorette party for (bride's name). Let's gather around and show (bride's name) how to dress for her new hubby. Join us for a lingerie bachelorette shower. Oh la la. Let's throw out the flannel and bring on the lace. Join us for a lingerie bachelorette party for (bride's name). Once the invites are sent, keep a file of things to do before the big day. The bachelorette party should be all about letting the bride have fun with her best girl friends. Delegate different duties to different girls to make the night or weekend more special. Duties can include purchasing a cake, getting matching hats or T-shirts for everyone, and making the reservations at the hottest nightclub. When the night arrives, every girl should be able to let her hair down and have a fabulous time.